This series will illustrate how to assess the elements of cutting for colored gemstones and how to better understand the impact of cut quality on the value of various gems. Part of that will include understanding the choices a cutter makes and why. While our focus is on forms of faceted gems, we will briefly touch on non-faceted gems. For our purposes, the word “cut” means more than just the shape of a gem; it also encompasses the elements of “cut quality.” Cut quality refers to how well the gem was manufactured, or how well various facets were placed. Combined with the proportions, symmetry, and polish, a well-cut gem should have a beauty that not only comes from its color and clarity, but from how the facets interact with light. The quality of the rough material limits the gemstone’s final appearance. Therefore cutters prefer rough that is transparent and without many inclusions. Some gems are rarely eye-clean, so some inclusions become acceptable in those materials. Since color is the highest priority for colored gems, how a cutter manages the light as it enters and exits a gem becomes an exercise in artistry. Ruby rough with a deeply saturated red color and free from even minor inclusions under 10x magnification will produce gems of noteworthy face-up color and appearance, even if the fashioning is poor. But if the faceting washes out the color or muddies its color by mixing dichroic colors, the cutter has failed miserably. Josh Hall (Vice President, Pala International, Inc.) helps place cut within the perspective of a gem’s overall value (from Hall’s personal comments—see Fig. 1-01). He states that color is about 60% of the gem’s value, followed by the location the gem comes from which can influence 15% of the value (this can be much more for certain origins, such as Kashmir sapphire). After that, cut and size each represent around 10% of the value followed by the shape (outline) of the gem. This article will add clarity and color zoning to the discussion. Each of these can be quite variable. Value Factor #1: Color is King! In color science, there are three dimensions to color: hue (red, green, blue, etc. ), saturation (intensity or richness of a color), and tone (lightness or darkness). However, when evaluating the color of colored gemstones, there is another aspect to consider: uniformity of color. Our eyes see color as seven colors of the rainbow: red, orange, yellow, green, blue, indigo, and violet. Each of these colors is made of rays of light, each traveling at different speeds with different wavelengths. When all of the above colors combine, we see it as white light. When white light enters a colored gem, part of the light can be absorbed. For instance, if a gemstone absorbs all of the colors except blue, only the blue will be visible, and we see the gemstone as blue. 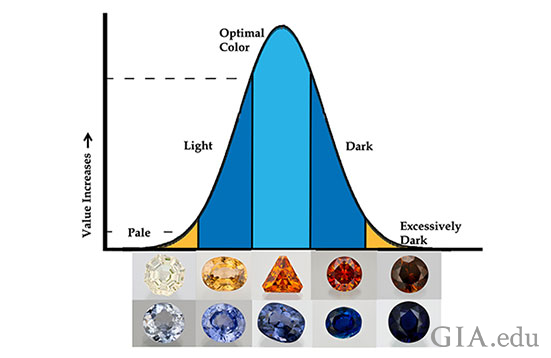 The optimal color range (combination of hue, saturation, and tone) for each gem is different, and for many gems, availability in the optimal color can be scarce (see Fig. 1-02). Pale colors usually have a relatively low value. However, pale blue-green (or mint) tourmaline from Afghanistan/Pakistan commands high prices, much higher than their more saturated counterparts from the same source. 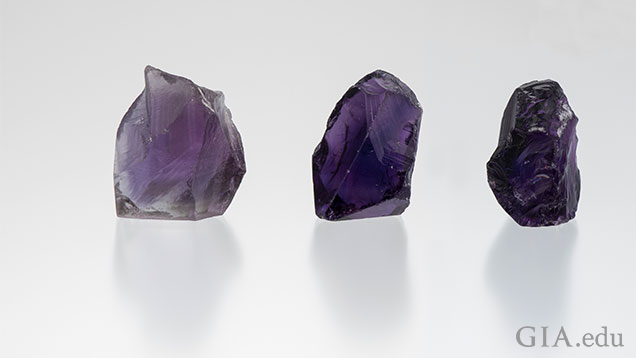 Wayne Emery (The Gem Cutter) points out that some retailers have learned that there are customers who prefer less saturated stones because they appear to be brighter and have more sparkle. Thus, less saturated gems might sell more quickly than the more saturated (and expensive) ones. From the jeweler's point of view, inventory turnover is very important and can result in much more profit over time. For this reason, some retailers prefer to use gems of lesser saturation in their designs to cater to this customer base. Gems that are so dark that it is difficult to see through them are more difficult to sell and thus their cost usually drops significantly. 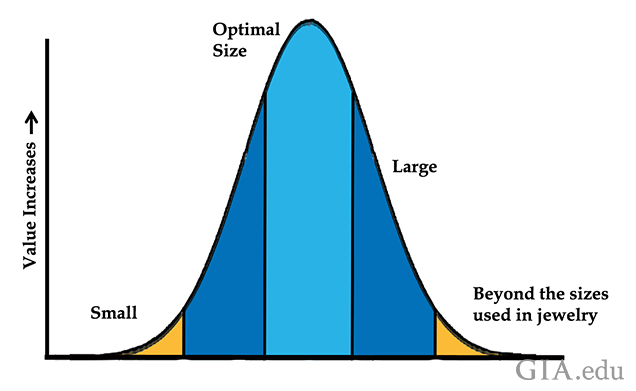 The optimal color can cause values to spike significantly. In most cases (except bi-colored gems), color uniformity or evenness is also part of this value equation. Gems that show a single pure hue are usually more valuable than gems that face-up with multiple hues. For example, evenly blue sapphires have more value than those with secondary green hues. 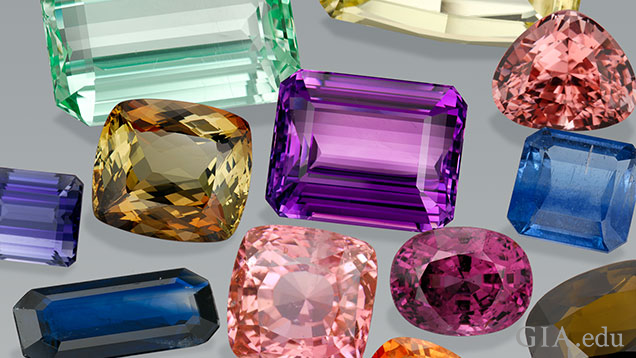 For a colored stone (non-diamond), color is the most important factor in determining quality. 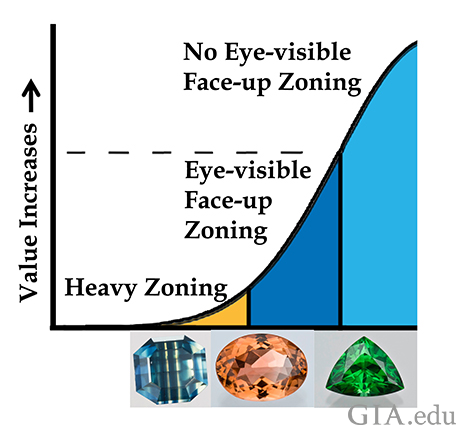 Any uneven distribution of color within a gemstone is called color zoning. Face-up color zoning has a value curve (see Fig. 1-03). Since uniformity of color is a mark of most fine gems, an increase in face-up color zoning is usually regarded negatively. To better observe color zoning, turn the gem upside down on a white piece of paper and look for uneven coloration. You probably won’t see this in some gems, such as peridot or topaz. Now turn it face-up. Can you see the same color zones or splotches of darker or lighter color that you saw when the gem was upside down? Placing the stone in a clear jar with water (or vegetable oil or baby oil—do not use oil with amber), set on a white background can help you see color zoning in a gem. For many colored gems, the country of origin, or the mining location, greatly affects the value (see Fig. 1-04). For example, this is truer and more extreme for an untreated sapphire of intense blue color from Kashmir, which is worth far more than a similar sapphire mined elsewhere. A few of the major grading labs have the equipment and expertise to determine geographic origin. An origin report from one of these labs is required in validating the gem’s value when highly regarded locations can significantly increase the stone’s price (more than the 15% in a couple of cases). Be cautious and read the report from a lab thoroughly. A standard report usually identifies the gem material, but not the geographic origin. Language used in a standard GIA Identification Report for a copper-bearing tourmaline will state, “This copper and manganese bearing tourmaline may be called ‘paraíba’ tourmaline in the trade. The trade term ‘paraíba’ comes from the Brazilian locality where this gem was first mined, however, today it may come from several localities.” The trade calls these gems Paraíba tourmalines even though the location is not from Brazil. Only if the gem was sent in for a country of origin report, will it indicate the country, such as Brazil. In that case the price will be impacted by the Brazil origin. The GIA Identification & Origin Report describes whether the stone is natural or synthetic, identifies the type of gemstone along with an opinion on the geographic origin of the stone, and includes any detectable treatments. This report also contains a detailed description of the gemstone such as cut, shape, weight, measurement, and color, and includes a photograph of the gemstone. 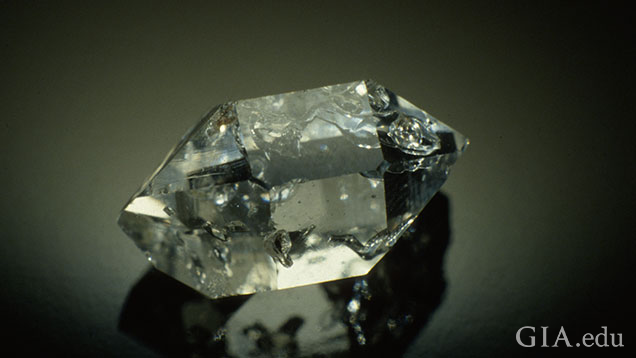 For collectors of crystals, “Herkimer diamond" is a generic name for a double-terminated quartz crystal discovered in and around Herkimer County and the Mohawk River Valley in New York. In the high-end gem market, trade names have been used to denote particular gemstone colors or face-up appearances from specific geographic locations. The names were just as unlikely and profuse: “Paraíba” tourmaline, “Biwa” pearl, “Sandawana” emerald, “Australian” sapphire, “Burma” and “Mogok” ruby. The names persist even when significant locations come and go. There is still strong consternation amongst many in the trade when a location is used as a name and the gem material isn’t really from that location. That doesn’t stop some dealers from calling a gem a “Kashmir” sapphire when its color mimics material from that location, and charging a false premium. 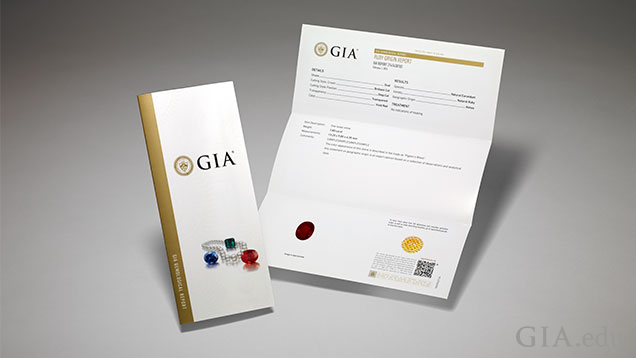 This is why a country of origin report from a major lab becomes important, indicating that the gemstone has been tested and has the features associated with that specific country. Finally, it should be mentioned that there is a great deal of poor material from highly prized locations, and in those cases knowing the country of origin shouldn’t provide added value. 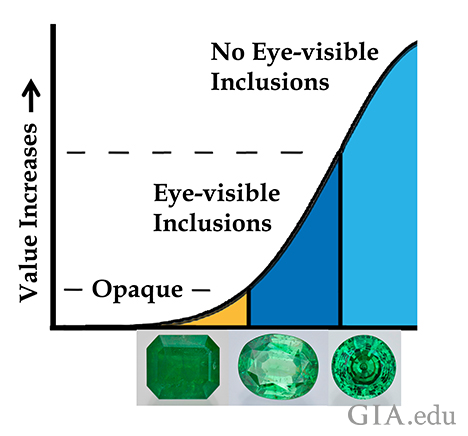 Size, which includes the weight and face-up diameter of each type of gem material, is also directly related to value (see Fig. 1-05). As the size increases to that of high demand, the price per carat goes up. Some gems are rarely seen above a couple of carats (e.g., benitoite), while others can weigh thousands of carats (e.g., quartz and topaz). Once gems get beyond a size that is common for jewelry, the number of interested buyers decreases significantly, and the relative value per carat diminishes. However, exceptionally large gems of superior color (gems that aren’t too dark) can be very expensive, particularly when they come from locations known for exceptional color. That’s because large sizes are rarely available from those locations except as near-black gems. Subject to various issues with the rough material, the yield—the final carat weight of the gem compared to the initial weight of the rough—can be as high as 50% (very rarely) or as low as a few percent; cutters evaluate the various pros and cons when planning to cut the gem. Sometimes the saturated colors only appear in larger sizes (e.g. kunzite or aquamarine), so that small gems of saturated color are rare and surprisingly expensive. Conversely, if a deeply saturated rough is cut into a larger gem, it can be too dark and not as valuable. A uniformly colored piece of rough yields gems of different color intensity as the sizes and proportions vary. For example, a gem cut from light colored rough is considered attractive if it reaches a certain size to produce enough color saturation. In this case, a cutter might cut one large, deep gem rather than several lightly colored, well-cut gems. In the case of dark rough, some cutters use the “white paper test” to determine the best yield from the piece of rough. A piece of rough is placed on white paper, and viewed under incandescent and then fluorescent light, each time staying away from any bright sources of light (see Fig. 1-06). The color seen through the rough is from light that is reflected from the white paper underneath. By using both light sources you see the colors the gem will have under both types of lighting. If the rough is too dark to see much color, it should be cut into smaller gems to optimize the color. Obviously, one could use a very bright light source to see through rough that would be black in many other situations. Wayne Emery suggests using a standard 100-watt incandescent bulb, one foot above a white paper in a dimly lit room. Clarity is an important value factor because gems are cut to sparkle and show off their color in interesting ways. If there are flaws that interrupt that sparkle, the gem is less interesting. 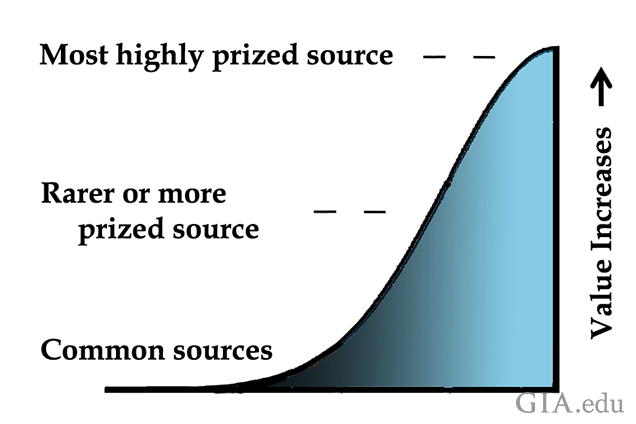 Hence there is a value curve related to clarity that is also true for each type of gem (see Fig. 1-07). Some gem materials are almost always found with inclusions, while others are commonly eye-clean (inclusions cannot be seen without magnification). There are some inclusions that actually help the value of specific gems. For example, microscopic light-scattering inclusions enhance the color uniformity in Kashmir sapphire by deflecting light into areas it would not normally go. The resulting velvety appearance of Kashmir sapphires adds value. Sunstone is also aided by light amounts of schiller (extremely tiny copper inclusions that create a cloud-like appearance), which in the right locations can add value. Demands for shape (a gem’s outline) (see Fig. 1-08) and certain cutting styles have evolved and changed over the years. Certain shapes, often coupled with certain cutting styles, are more popular now because they work better with current jewelry designs. 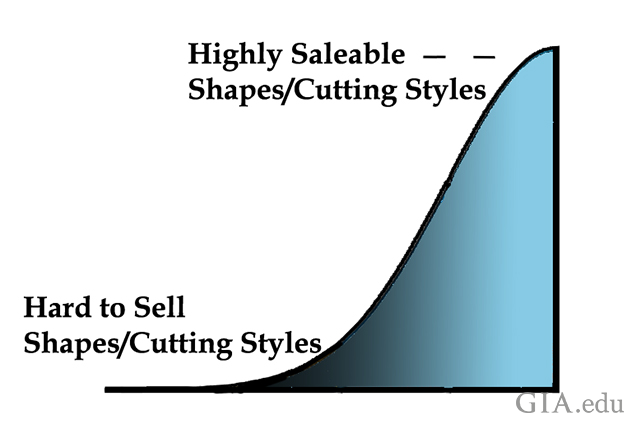 Other shapes are hard to sell as few people desire them, or they only work in a few designs. For instance, pear shapes are rarely sold for anything other than pendants and earrings, limiting their market. The creativity of the designer can help sell certain shapes by creating a unique appeal for a shape that is commonly avoided. Some gem materials, such as tourmaline, are rarely cut as round shapes. Tsavorite garnet is not often fashioned as an emerald cut. Yet these shapes in these materials sell for more when available. Other materials are almost exclusively seen as round (Montana sapphire) or emerald cut (emeralds). The curve that reflects the current popularity of certain shapes and cutting styles, and their position on the curve, will change over time as demand shifts with fashion trends. Richard Hughes (of Lotus Gemology) pointed out that classics will sell better because fine jewelry is often purchased by older people (young people have less money) who often have conservative tastes. Let’s stop for a minute and state the obvious: Jewelry and gems are personal, and are a reflection of the person who wears them. Therefore, why would we want to have choices that are not great looking? When center (or main) pavilion facets are cut too shallow for that gem material, light passes through so that we see what is behind the gem (see Fig. 1-09). This is called windowing. If we can see the girdle reflecting under the table, it is called a fisheye. As dirt accumulates around the edge of the mounting, that girdle reflection will be the color of the built-up dirt (often grey or brown). These cutting styles are rarely attractive. Josh Hall’s last element of colored stone value (see Fig. 1-01) is Quality of Cutting. An exceptionally well-cut gem can add more than Hall’s estimated 10% to a gem’s value. In today’s market, a number of gem cutters are known as “artists.” Gems from named artists can have significant additional value due to the artist’s popularity (see Fig. 1-10). Even local cutters who are not recognized on a national level can get up to 40% added value for their work with some jewelers. If the gem were uncut, its value would be significantly less. 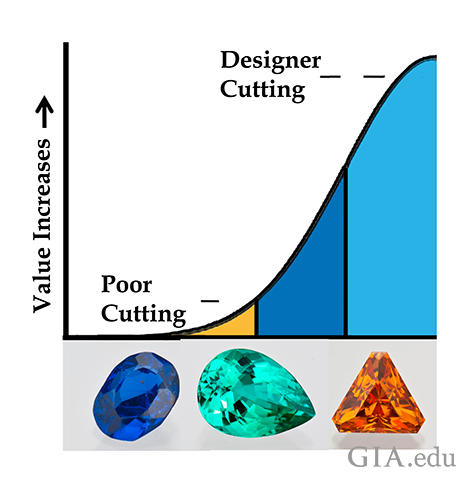 The impact of cutting on a gem’s value is proportionate to its rarity. An extremely rare piece of rough sapphire that sells for tens of thousands of dollars does not necessarily double in price when cut. It has added value, due to the cutting, but the cutting adds only a small percentage. Compare that to the value added to a piece of ametrine rough that may have cost a few hundred dollars but is then cut by a named artist. In this first installment of the series, we have reviewed the seven major factors that affect the price of a colored gemstone: color, uniformity of color, country of origin, size, clarity, shape, and quality of cutting. 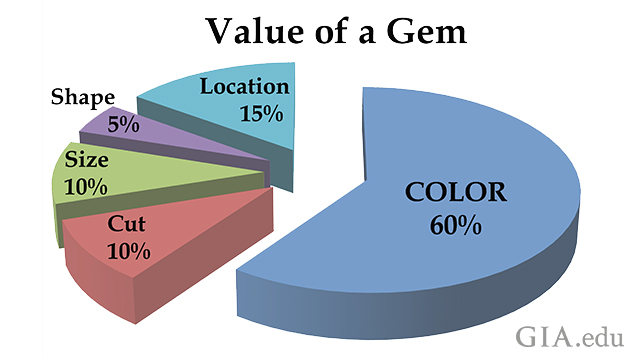 Taken together these are the primary factors that determine the overall price or value of various gems in the market in which they are sold. UP NEXT: Part 2: “Gem Cutting Styles - Definitions” establishes a common language for discussing cutting styles, with a focus on basic faceting styles, and offers a short discussion on cabochons and beads.